Talk Points of the Keynote Speech by Mr. Zhang Bin, Minister Counselor of Chinese Embassy to Nigeria at the Round-table Session on the topic of “Examining the current trends in Nigeria and China Economics; Observations and Projections” (Centre for China Studies in Abuja, 2:30pm 23 September 2015). I am glad to attend this Roundtable Session organized by the Centre for China Studies. l appreciate your interest in development in China and wish to take this opportunity to share with you my humble observation of the current trends in China`s economy. Recently many people around the world are talking about the slowdown of China’s economy, some of them even worry about China will encounter a hard landing of the economy. To be honest I think such kind of statement doesn’t comply with the fact and obviously is exaggerated. Chinese Premier Li Keqiang recently made a special address at the Ninth Summer Davos Forum, and pointed out that against the background of sluggish global economic growth, the “shape” of China’s economy can be described as “there have been some ups and downs, but the underlying trend remains positive”. Actually in the first half of the year 2015, China’s GDP managed to grow by 7 percent year on year, which is consistent with the expectation of the whole year and still among the highest of the world major economies. In particular, we are talking about a US$ 10 trillion economy, for which 7% growth actually generates more increase in volume than the double-digit growth in the past. The other key economic indicators in the first half of this year, including employment, income of residents, margin or price rise and scale of foreign trade. mostly keep stable and show that there has been overall stability in China`s economic development, despite certain moderation in speed. For example, the surveyed urban unemployment rate is around 5.1 percent and more than 7 million urban jobs have beennewly created. What is more encouraging is that China`s economic structure is rapidly improving. Today, the services sector already accounts for half of China‘s GDP, and consumption contributes 60% to growth. Growth in high-tech industries is over 10 percent, which is notably higher than the entire industrial sector. Consumer demands for information, cultural, health and tourism products are booming. Energy conservation, environmental protection and the green economy are thriving. New economic growth areas are rapidly taking shape. Though the overall trend of China`s economy is positive, there are also difficulties to overcome. As the traditional growth drivers get replaced by new ones, it is natural to see fluctuations in some of the economic indicators on a monthly or quarterly basis. This has happened this year, last year and the year before last as well. As Premier Li Keqiang said, China will not be swayed by short-term fluctuations in certain economic indicators, but will not take them lightly either. China will undertake preemptive adjustment and fine-tuning as appropriate, and step up targeted macro regulation. l am confident that China has the capability to maintain medium-high speed of growth and achieve medium-high level of development. ln a word, China`s economy is still running within the proper range and its future will be even brighter. China’s stock market and debt also attracted close global attention. What I want to say is that Risk is everywhere. Any country will face financial risk if they don`t manage the system well. It is undeniable that there have been some unusual fluctuations on China`s capital market in last June and July. Chinese relevant authorities already took steps to stabilize the market to prevent any spread of risks. Now l think China has successfully forestalled potential systemic financial risks. It needs to be stressed that this is not to replace or weaken the role of the market. What China did is common international practice and is in keeping with China`s national conditions. Going forward, China will continue to develop a multi-tiered capital market and pursue a market-driven and law-based approach in this process. The purpose is to establish an open and transparent capital market of long-term, steady and healthy growth. On China`s government debt, the risks are also under control. China`s government debt is still at quite u low level. The central government debt is below 20 percent of GDP, and over 70 percent of local government debts take the form of investment with returns. Those who are concerned that China`s government debt may bring serious risks are worrying too much. Having said that, l don`t mean to question if there is a need for you to raise this issue, because for the Chinese, our philosophy is that one should always be mindful of potential dangers as even in times of peace. China will press ahead with the financial reform in order to further strengthen financial stability and opening-up. I believe that you have noticed the Chinese RMB devalued not so long ago. Some people think that the main purpose of RMB devaluation is to boost exports and it might trigger a chain reaction. Here is my opinion. First of all, l wish to draw your attention to one fact: Since 2013, the real effective exchange rate of the RMB has appreciated 15 percent. As many currencies significantly depreciated against the dollar recently, developments on the international markets compelled China to adjust the quotation regime of the RMB central parity. Yet it was a small adjustment. Now the RMB exchange rate is basically stable. There is no basis for continued depreciation of the RMB because China`s economy has been operating within the proper range, China has ample foreign exchange reserves and surplus of trade in goods, which separately stand at 3557.4 billion US dollars and 368 billion yuan by the end of August. All these show that the RMB exchange rate can stay basically stable at adaptive and equilibrium level. It is no need for China to boost exports by devaluing the RMB. This is not in keeping with China`s policy of structural adjustment. Still less does China want to see a global “currency war”. As the Chinese economy has become so highly integrated into the global economy, a “currency war” would only bring more harm than good to China. Let’s move to the impact of China`s economy on the world. Some people said the recent fall of international commodity prices, including the crude oil price, were largely caused by the slowdown of China’s economy and decline of its external demand. And this will especially harm the African economy, which depends on raw materials exports a lot. The answer is definitely no. l understand the international commodity prices are issues of great concern in Nigeria. But commodity prices are not something for Chinese to decide only. Take the crude oil price for example, it has dropped significantly since the middle of the year 20I4, and once fell to under 40 US dollar per barrel not a longtime ago. There are many reasons for the fall of crude oil price, but two that l believe are most important are the shale gas revolution and the depressed world economy. Because of the shale gas revolution, U.S. oil production capacity has been dramatically increased, and its crude import volume is gradually declining. In fact, China has replaced US to become the world`s largest crude oil importer since this April. Of course, the depressed world economy is also an important limiting factor of increase of crude oil demand. China’s steady economic development has benefited the world. China contributed about 30% to global growth in the first half of the year. With commodity prices dropping markedly on the global market, the growth of China’s foreign trade volume is slowing down. But even so, the actual amount of commodities China imported has continued to go up. Between January and August this year, China imported 220 tons of crude oil, up by 10% percent over the previous year. Soy bean imports rose by 7%, and iron ore imports were over 600 million tons, more or less the same last year. China will adopt a more proactive import policy and place greater emphasis on the quality of imports and exports. And China will only buy more from the world including Africa to meet its growing domestic demands. China’s outward investment has maintained rapid growth. The number of outbound tourists has notably increased. Last year alone, Chinese tourists made over 100 million trips overseas. In the first half of this year, the number rose by another 10%. China is not a source of risks for the global economy, but a driver of world economic growth. The Chinese economy is deeply integrated into the global market. Given the weak growth of the global economy, China could not stand unaffected. In this regard, I’d like to say something about the co-operation between China and African countries, especially with Nigeria in the coming days. Africa is an important partner to China. Ln the past decades, China-Africa relations have kept a good momentum of over-all development, with growing political mutual trust and frequent high-level exchanges. roaring fruitful economical cooperation and deepening mutual understanding between Chinese and African people. In 2014, the trade volume between China and Africa has reached $221.8billion. for six years in a row, China has been Africa`s largest trade partner. China’s FDI in Africa has grown from zero to $28.5 billion, creating tangible benefits to both Chinese and African peoples. Indeed China`s economy is facing some temporary difficulties now, but the development prospect is still bright. China has the willingness and capability to further expand the cooperation with African countries. As you know Chinese premier Li Keqiang has highlighted the importance of production capacity co-operation between countries at different stages of development in his special address at the Ninth Summer Davos Forum. I completely agree with him and think the production capacity cooperation is the best approach of cooperation between China and African countries. After over 30 years of reform and opening-up, China has enormous and advantageous industrial capacities, strong engineering and service capabilities, and large foreign exchange reserves. It is able to provide Africa with advanced facilities and products, while Africa is accelerating industrialization and urbanization, and has a strong demand for applicable technologies, equipment and infrastructure. China wishes to actively participate in this process and help Africa realize the dream of sustainable development, regardless of how the world economy fluctuates. And I think the cooperation between both sides will be mutually beneficial and help us to achieve common development. Nigeria is the largest engineering contracting market, the second largest export market, the third largest trade partner and major investment destination of China in Africa. 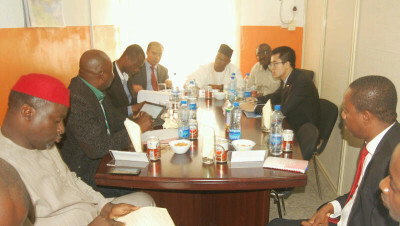 The cooperation between China and Nigeria has developed smoothly and scored impressive achievements in recent years. China and Nigeria are both the biggest economy and have the biggest population in their respective region. We have taken note that the new Nigerian government is planning to develop the infrastructure, power industry, manufacturing sector, agriculture, textile and to tap the potentials of mineral resources, and these are some of the areas that precisely China is well equipped, because we have got such expertise, financing, technology and management, which are all needed by the Nigerian side. In this sense, China and Nigeria are highly complementary, and the cooperation between the two countries would be full of great potential and embrace a bright future. “Examining the current trends in the Nigeria and China’s economies: Observations and Projections”.